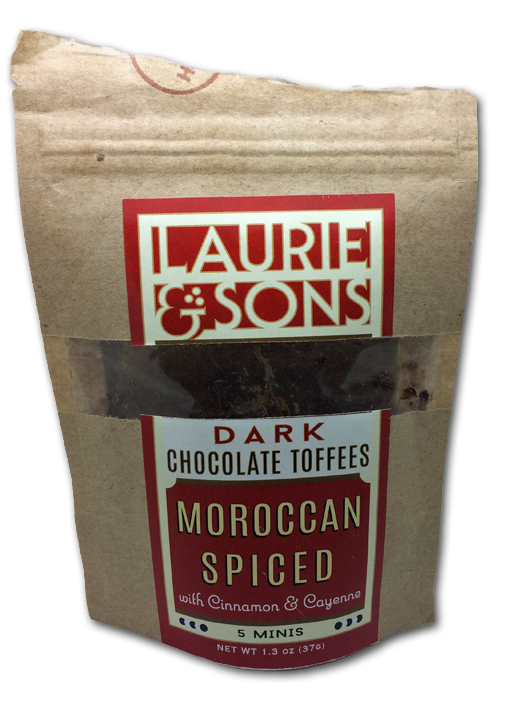 I want to meet this “Laurie” character, because she’s on to something with this toffee. Let me be brutally honest first though: I would NEVER have bought these myself-a friend picked them up for me. The thought of Moroccan spiced toffee just didn’t make sense to me, those extreme savory flavors matched with the buttery sweetness of toffee. Granted, I’m impatient so I didn’t read the line below where it says “with Cinnamon & Cayenne”, which makes a LOT more sense, but…that’s just my style. You can really see the pepper flakes on top. This tease of a bag comes with 5 “minis”, which I suppose is enough for me in one sitting, but dammit, I wanted more. The first note you get with these is the cinnamon, and again, for full disclosure, I don’t really dig on cinnamon. I don’t really know why, I just don’t love it. So there really wasn’t a lot of hope for these, I was thinking as I piled one in my mouth. But subtlety is the keyword here: the dark chocolate and cinnamon actually play very well together. 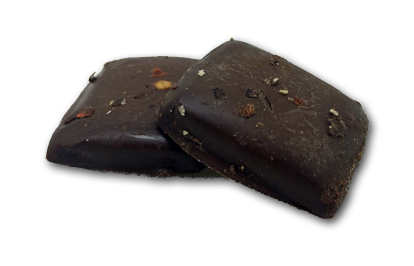 Soon, a mild toffee crunch comes in-it’s not a super hard, crispy toffee-more like a thinnish layer that provides that delicious change of consistency & salty notes. But then, the star of the show arrived, the cayenne. Subtle, to me, yes. But to some it might be a bit on the spicy side. I absolutely adored it though. It made this confection so interesting, and so different. Sweet heat. I loved these. I’d buy them for sure, and if you’re a toffee person, you have to check these out. Even someone like me who didn’t think this set of ingredients would work well together loves them, so why not you? Click the link below to be taken to their store. They have a lot of other tasty looking varieties that I can’t wait to try myself. Buy from Laurie & Sons!